So last night the cousin, ZT, got me all excited about Topshop Make Up by showing me some awesome videos. It isn't that I haven't got any Topshop Make Up. I have quite a bit (Click here.) and I have clearly forgotten about them. :\ Well, actually I just kind of threw them back into the dark recesses of my mind when the crayons went all smudge-y on me. But I haven't bought makeup for a really long time, not taking Lioele's Water Drop BB into consideration because well, B.B. creams are a necessity and moving on with life (Heh.)... The videos got me into such a frenzy that I had to go down to Topshop today. Had to. But sigh. There were many things which weren't there. I wanted the Blushes in Butterscotch and Nutmeg but they aren't even available online. Are they all out of stock?!? These are Cheeks in Prism and Luminescence. 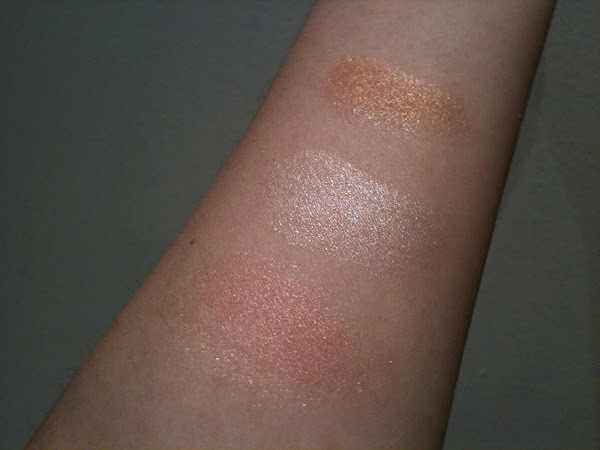 Recently, I have gone all gaga over highlighters (Canmake's Highlighter in Baby Beige 05 is so pretty!!! I have been spamming it so much so that I look like I left my eye area behind when I went swimming. Or that I wear goggles 24/7. Yeah, whatever. SO PRETTY.). The first one is Ray, which I gave a miss. I think it will be perfect for ladies with darker skin tones. These pretty, albeit bulky, sticks can be used on the lips and body. They are not to be used on the eyes. Take note! Head Over Heels on your left and Pinch on your right! And lastly, these are the videos that got me all flushing with absolutely undiluted excitement! Is your heart thumping now? Heh heh, if it is! Haha! And umm if it isn't, well... Good day to you! Heh! Tscha: Hey! Yes, they are! Have been since the start of the year! The blushers are going at $13 and the all-over sticks at $23. Nail polishes are $13 or $16. hazelhearts: Hi Hazel! Yes, the last look's very pretty!